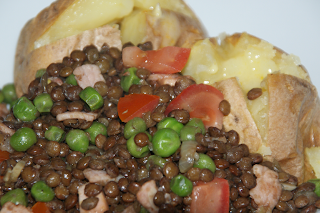 Puy lentils are both delicious and satisfying. In this recipe the lentils and peas are first boiled and then the flavour bomb of bacon, onions and garlic is added before serving. Boil the lentils and garlic clove in unsalted water until the lentils are tender and succulent. Add the frozen peas and cook for about 6 minutes until the peas are done. Drain and keep warm. Fry the bacon in the olive oil until crisp and add the onion. Reduce the heat a little and stir and fry until the onion is soft. Add the garlic and continue to stir and fry until the onions are beginning to caramelise. Now add the lentils and peas and stir to mix and re-heat the lentils. Season to taste and garnish with chopped fresh tomatoes. This dish can stand alone as a light lunch with a baked potato (pictured) or crusty bread and a rich shiraz, but it is equally at home on a buffet table or as a side dish to roasted meats and game.